CAPA College students excel in the college’s first Intensives Week – CAPA College (Creative and Performing Arts College)…excellence in Arts training & education. It is safe to say that no two weeks at CAPA College are the same. 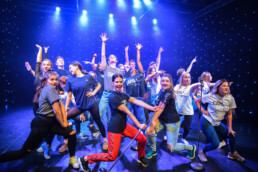 Yorkshire’s leading Creative and Performing Arts College provides excellent Arts training and ‘Outstanding’ education to young people aged 16 to 19 from across the North of England. Every day is filled with song and study, dance and drama as students take their first steps towards a professional career on stage and backstage. However, life at CAPA College became even more energetic and exciting recently when all 106 full-time students were taken off timetable for the college’s first Intensives Week. Intensives Week was an opportunity for students to focus on a particular project, learn new skills and techniques and experience the vigour of a professional rehearsal schedule. They worked in six companies to a strict commission in order to create six new and original works. Over the course of the week, students were supported and challenged to master new choreography, interpret scripts and devise new pieces, learn new vocal arrangements (both accompanied and a capella) and shoot and edit their own short video. Despite the demanding nature of these projects, students approached Intensives Week with professionalism and enthusiasm and it wasn’t long before the music of Hamilton could be heard blasting from the singing studio, shrieks and soliloquies emanated from the drama studio and all manner of contemporary movements were being perfected in the dance studio – all fastidiously captured on film by our talented Production Arts students. CAPA College were delighted to welcome back some of their most dedicated graduate students for Intensives Week who were on hand to help lead workshops, choreograph new pieces and give careers advice to current students. The team included Alex Bowen (CAPA College Graduate 2010) who, fresh from performing in the world premier of Dusty, devised a dance piece based on The Handmaid’s Tale entitled Under His Eye. Contemporary dancer and regular CAPA College teacher Keith Luke Gillott (who graduated in 2011), CAPA College and Guildford School of Acting graduate Will Taylor and CAPA College alumni Lucy Aspinwall (who is now studying for an MA in Choreography at Leeds Beckett University) also created a new piece based on the play Terra by Nell Leyshon. After five long days of rehearsal, the students created six phenomenal pieces of work: high energy, polished and showing real depth of skills. The progession they have made in just seven weeks of study is remarkable; a credit both to their willingness to learn and the expert teaching on offer at CAPA College. Don’t take our word for it – after seeing the work presented at a friends and family showcase event, one parent remarked “I’ve never seen my daughter shine so bright”, while a sister declared “it was fantastic to see so many students thriving in their art form, ALL clearly loving their time at CAPA College and using their passion for the arts as a driving force to succeed”. We can’t wait to see what the future holds for this exceptional year group. The class of 2020 will be one to remember!